Kīholo Bay is a protected series of calm, turquoise tidepools inside a picturesque bay. It’s a great place to spend a beach day, especially if you want to be a little more off the beaten path. This bay used to be a bit “loved to death” by tourists and locals, but conservation efforts have really improved the location over the past few years. The biggest improvement has been prohibiting driving on the beach, which used to account for most of the ecosystem damage. If you want a look at Kīholo Bay before hiking down into it, stop by the marked “Scenic Area” adjacent to mile marker 82 along Hwy 19. The water in the bay often appears to be turquoise as a result of the mix of freshwater and seawater. This mix of salt and freshwater also creates murkier conditions than other locations on the Kohala Coast. Kīholo is one of the best places to view sea turtles. This hike travels west from Kīholo to a named point on a lava bench above the ocean called Mano Point. The hike passes three black sand beaches and two brackish ponds following the Ala Kahakai National Historical Trail. Meaning "shore line trail," this broken trail system preserves an ancient trail that ringed most of the island in this area. It allows easier passage through the rough lava south of Kīholo including the 1800 Kaʻūpūlehu lava flow from Hualālai. This moderate hike is a great way to find solitude. This area is under park reserve status and still undergoing conceptual planning for future public use. Hours: Summer: April 1 to Labor Day: 7 am to 7 pm. Winter: After Labor Day to March 31: 7 am to 6 pm. Gates are locked nightly. Camping is allowed for a fee on weekends only (Friday through Sunday nights), and sites may be reserved up to 30 days in advance. Reserve Camping here. The trailhead has a portable toilet but no other facilities. No animals are allowed except properly registered service animals. No fires are allowed and no alcoholic beverages are allowed. 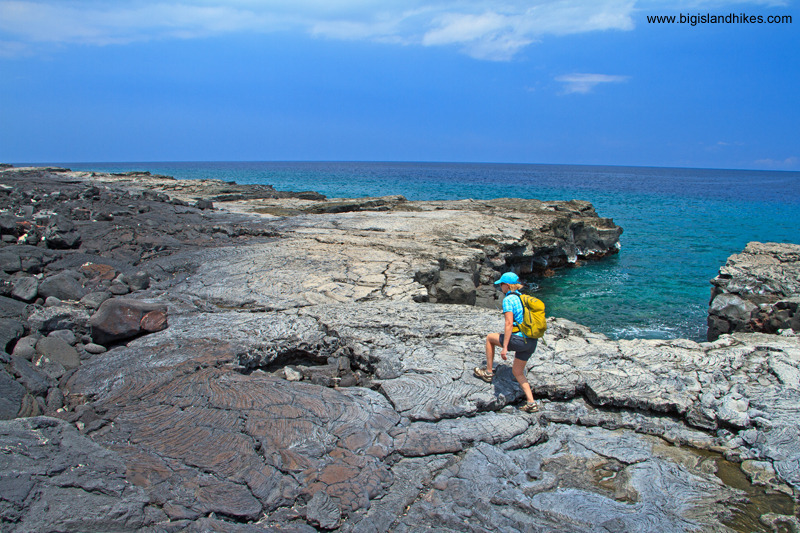 There are two other hikes that use the same trailhead: Kīholo Bay and Kīholo to Keawaiki. Trailhead: Just south of the scenic area adjacent to mile marker 82 on Hwy. 19 north of Kona, find an unmarked gravel road leading makai (toward the ocean). This dirt road is graded periodically, but it can be pretty rough in some spots. A carefully driven passenger car can certainly make it to the trailhead, but there are also a few pull-outs to bail and park along the access road if you think you might not make it. It can be tough to pass two cars in some areas, so drive slowly. Drive to the end of the road where there is a turnabout to help turn your car around. The trailhead has a portable toilet but no other facilities. Gear: Standard hiking gear. The trail is rough and rocky, so wear your boots. Bring plenty of water and sun protection. Hike: Beginning at the roundabout parking area, walk a few yards out to Kīholo Bay and enjoy the view. Keep your eye on the murky water here because honu, green sea turtles, love to eat the seaweed in the bay. After you've checked out some interesting tidepools, hike west along the rocky coastline past several picturesque trees. You'll quickly discover a nice black sand beach with an anchialine pool inland. An anchialine pool is a landlocked body of water with a subterranean connection to the ocean, with both fresh and saltwater. This oasis-like retreat is called Waia'elepi. You should stay out of this pool. Enjoy the black sand beach and find a faint White coral marks the trailtrail in harsh lava at the far end of the beach. The lava trail quickly gains some altitude and follows the rocky coastline. You'll encounter a lavish estate with lush foliage. The foliage masks another large anchialine pool named Luahinewai. It's all private property, so just keep hiking down the pretty black sand beach adjacent to Luahinewai. Cross more rough lava trail and find yet another black sand beach in a small cove. This is the last spot for dip for a while, so take advantage if you're so inclined. Climb up out of the third black sand beach and pass Nawaikulua Point, where your vantage along the coast begins to change. This portion of trail jogs a bit inland on the ancient Ala Kahakai trail system. It's marked by polished, flat lava stones on the base of the trail and white coral markers along the sides. 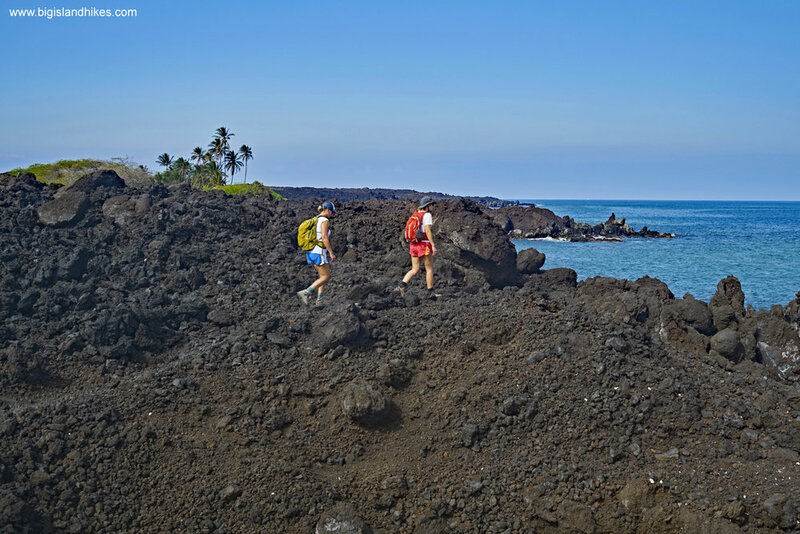 Hike for a bit less than half a mile along the ancient trail until it drops onto a lava bench above the ocean backed by dense foliage and white sand. Hike down to the lava bench and take in the splendor. You're in a place that few people see. The trail ends at the lava bench, so make your own way safely, constantly watching the ocean, across the bench toward Mano Point. Mano Point might not be obvious, but it has an aquatic sign on it, and it's also the end of the dense foliage. I chose to end the hike here because there's a lot of new mega-resort development past here. However, you can follow the coastline all the way down to the Four Seasons resort at historic Kaʻūpūlehu, some two miles beyond Mano Point. There are some very eroded ancient sites near Mano Point. Don't contribute to the erosion by walking on walls or removing any rocks. When you're ready, return the way you came back to Kīholo.